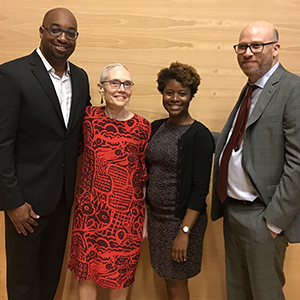 On September 4, Bank Street Graduate School of Education welcomed prolific poet and award-winning children’s author Kwame Alexander to speak at the College’s annual Barbara Biber Convocation. The esteemed lecture, which is the centerpiece of the Graduate School’s orientation each year and a welcome for incoming graduate students, creates a space for the College community to engage with seminal scholars on leading issues in education. Alexander, 2015 Newbery Medalist for his book, The Crossover, has been a guest of honor at Bank Street events in years past and served as the School for Children’s inaugural Dorothy A. Carter Writer-in-Residence in the Spring of 2015. He was invited to return to the College as the speaker for the this year’s Barbara Biber Convocation to share with Graduate School students the many lessons he has learned throughout his celebrated journey as a writer and educator. Alexander also told the ironic story of his turbulent relationship with black poet Nikki Giovanni, who taught his advanced poetry class at Virginia Tech. He expressed that Giovanni was deeply critical of his work, repeatedly marking his papers with C grades. He mimicked her harsh words, “You’re a good poet, Kwame, and I can teach you the tools. But I cannot teach you how to be interesting.” Later in college, Alexander wrote a play about how terrible of a professor she was, which was cast before a standing-room-only audience at Virginia Tech. What happened between the two down the line was nothing Alexander could have imagined. Alexander went on to spotlight others who deeply influenced his life and work, like his daughter, whose experiences with love and heartbreak as a teenager inspired his book, Crush: Love Poems for Teenagers. He also shared a look at his program Bookinaday, which teaches students in one single day the fundamentals of creative writing and book publishing. The program has produced nearly 5,000 K-12 authors in 76 schools across the United States, Canada, and the Caribbean. Alexander wrapped up his talk with the humorous and moving tales of his experience teaching poetry to high school students who are incarcerated in the DC area, which he described as “one of the most difficult but probably the most rewarding things I’ve ever done.” He spent six months teaching them how to connect with poetry. Shortly after his work wrapped up, a student in the program named Sloan, who had been released from prison and was living in a halfway house, called on Alexander to help him publish a poetry book with his housemates. And so, Concrete Dreams was born. And this is exactly what Alexander strives for in his work. What shone through his powerful talk was his desire to pay it forward—to help people find their voice in the same way that his “teachers” helped him along his journey. And this is what he implored incoming Bank Street graduate students to do with their students.